Lee's Pumping and Septic Service provides residential and commercial septic tank pumping, grease trap cleaning, septic certification, sewage ejectors, septic tank riser installation, and port o potty outhouse cleaning. Residential port o potty outhouse cleaning. Here are a few questions answered about septic tank systems. Regular inspection and periodic septic tank pump-outs by Lee’s Pumping and Septic or a licensed liquid waste hauler are essential in the long-term care and maintenance of your septic system. What are the reasons for septic system failure? The most common reasons for septic system failure are improper use and lack of periodic pumping of the septic tank. A licensed liquid waste hauler like Lee's Pumping will remove the solids and other materials or sludge layer that forms at the bottom of your tank to prevent any solids from clogging your disposal system and causing premature system failure. Proper system maintenance is the responsibility of the property owner. By performing a few simple maintenance procedures and having a proper system pump-out, you can save on costly repairs to your septic system. What should I do to assure my septic system is being properly used? Don't use garbage disposals or pour cooking grease, oils or other materials like paper towels, sanitary hygiene products, condoms, cigarettes or plastics into your septic system. These materials can overload your tank and end up clogging your disposal fields. Be careful with the amount of non-biodegradable chemicals used in your septic system like detergents, bleach, fabric softeners, paints, paint thinners, motor oil, degreasers and household hazardous wastes. A septic system is a natural living environment, so you want to limit chemical use as much as possible. Practice water conservation by washing full loads of clothes, fixing leaky faucets and running toilets, and installing low-flow plumbing fixtures. Don't drain swimming pools or hot tubs into a septic system. The more water you pump through your system, the more stress you put on it. Septic tank additives have not been proven to be effective and are not recommended for use in septic systems. When landscaping, make sure plants and trees are compatible with your septic system. Roots can damage pipes and clog the drain field. Grass is the best type of cover. 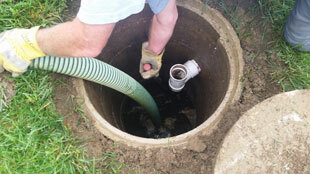 These simple practices allow your system to operate at its best and can greatly extend the life of your septic system. 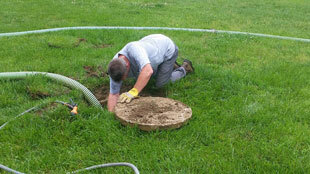 What must be done before a septic tank can be pumped? I’m thinking of buying a house. What should I know about its septic system? It is necessary to have Lee's Pumping and Septic or a licensed technician or plumber inspect the tank and drain field before you close on a property. How can I assure my hauler conducts a proper system pump-out? 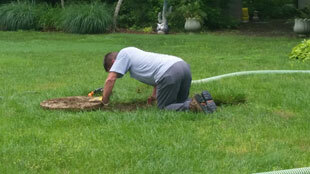 The best way to guarantee a proper system pump-out is to watch how your septic tank is being pumped. All contents from each compartment of your septic tank should only occur through the access lid of your septic tank. How can I determine if my septic system has failed? Look around the area of your septic system to see whether a system overflow or failure has occurred. If you notice signs of ponding water or areas that seem wet all the time, consult with a licensed disposal system contractor and get the appropriate County permits to properly repair or replace your septic system.